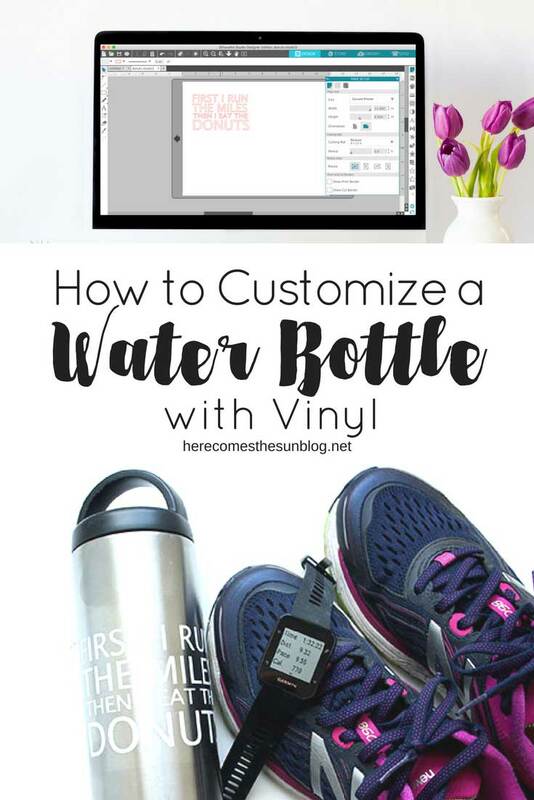 Learn how to customize a water bottle with vinyl! A fun and easy project to personalize any water bottle. If you have been following me on Instagram for some time, you know that I’m a runner. Last fall, I ran the NYC Marathon. It was on my bucket list of things to do and it did not disappoint. All runners know that hydration is key to running. But another key to running is proper nutrition. And in my mind… that means donuts. Just kidding about donuts being proper nutrition. I don’t want to get any nasty comments about how I’m giving bad nutrition advice. But I love donuts… specifically chocolate frosted donuts with chocolate sprinkles. Because…chocolate. 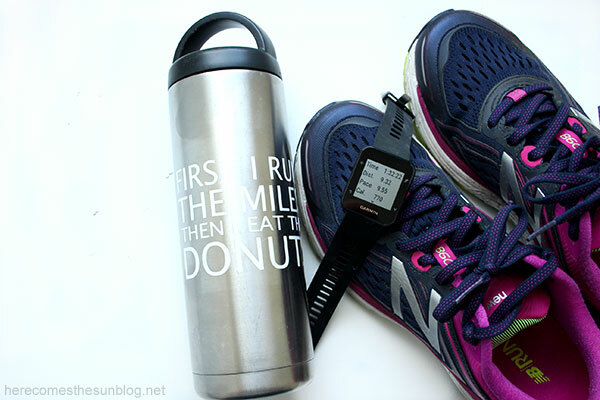 So I decided to customize a water bottle with vinyl using one of my favorite quotes: “First I run the miles, then I eat the donuts”. It’s like they made the quote just for me. Because every athlete (and non-athlete) needs a donut once in a while. Water bottle – my favorite water bottles are stainless steel because they keep your water super cold and they don’t get all gross inside over time like plastic water bottles. My favorite brands are RTIC and Contigo. Measure your water bottle to determine the size that your design has to be. Place transfer tape over the vinyl design and use a scraper tool to make sure it is adhered to the transfer tape. Check out this post for more details on using transfer tape. Please note that this cut file is for personal use only. you may not sell or redistribute it. This is such an easy way to personalize a water bottle. Once you have done this once, you will be making lots and lots of water bottle labels. The next custom water bottle label I’ll be making will probably be one with my name on it so people (my kids) stop stealing my bottle. Can I use regular (non-permanent) vinyl? You can use regular vinyl but I would recommend a permanent vinyl because you will be washing your water bottle. Can my water bottle be placed in the dishwasher? I do not recommend placing the water bottle in the dishwasher after the vinyl is adhered. Hand wash your water bottle with a mild detergent.